During this season of Advent, as we prepare for the celebration of God’s gift of love to our world, we wanted to share our own gifts with you, our faithful readers. Several of our regular writers were asked to share either one of their favorite Christmas books, or just a favorite children’s book that they love, and those will be posted during the next few weeks. These ‘bonus’ writings will not follow our normal review format, but we share them with you in hopes that you may discover a new book and learn to love it as our writers do (or an old book and appreciate it in a new way). This will be the last of the Advent Gift posts. We will begin posting book reviews again on January 5. 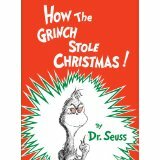 How the Grinch Stole Christmas by Dr. Seuss is one of my favorite Christmas books. I enjoy reading this book to my children. I had read this book almost every day during the Christmas season to my children when they were in Pre-school and Kindergarten. My children are in 5th and 6th grades now and I still read it to them a couple of times during the Advent season. I love the rhyming words and enjoy its captivating effect on young listeners. This book not only is well written but also carries a very important message for all of us. We get so carried away about the business of the season that we fail to pause and think that Christmas is much more than the presents, decorations, parties, and other stuff. Christmas is the time when we should remember that God came in human form. It is a time when we like Christ should empty ourselves and think of others. Christmas is a time to grow into Christ’s stature. Growing up in India, Christmas was the biggest festival for my family. We celebrated Christmas by going to church. My parents gave four siblings and me new clothes for Christmas, a cake, and a special meal. They could not afford presents or toys. But that did not bother us. We enjoyed Christmas anyway. Presents were not part of Christmas for us. We treasured the time spent with family and friends at church more than decorations, trees and presents. Things have changed. Now my siblings and I give presents to our children, presents we never had. We try to give them our best. We don’t do the Santa’s list but we give them at least a couple of things they want for Christmas in addition to new clothes, Christmas cake and a good meal. Christmas comes, no matter what –presents or no presents. Time spent with family and friends becomes part of our Christmas memories. We can always give the priceless gifts of love, peace, and joy that we received in Jesus Christ. Let’s go out and spread that good cheer with a simple smile or a kind word especially with those for who life is grinchy. Thank you to Union Presbyterian Seminary alumna Mary Taneti for this final Advent gift to our readers. Advent Gifts: How the Grinch Stole Christmas by Storypath is licensed under a Creative Commons Attribution-NonCommercial 4.0 International License.